FALLS CHURCH, Va.—Attorney General Jeff Sessions said America’s asylum system is riddled with problems, and human smugglers have, for years, been instructing illegal immigrants on how to apply for asylum. 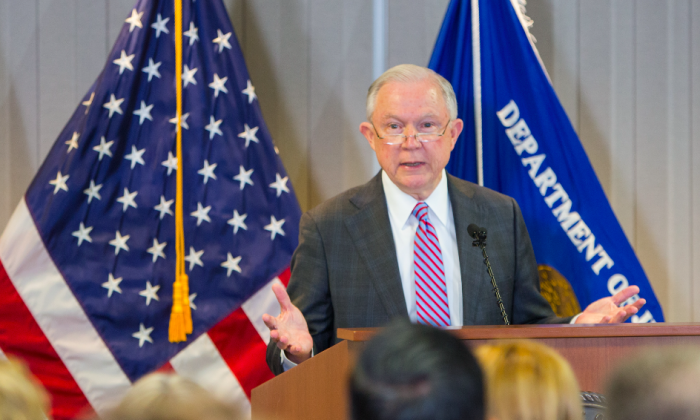 “The credible fear process was intended to be a lifeline for persons facing serious persecution,” Sessions said at the Executive Office for Immigration Review (EOIR) building in Virginia on Oct. 12. It’s as simple as crossing the border illegally; once apprehended by immigration agents, the individual claims they have “credible fear” of returning to their home country. Then, due to a 2009 Obama-era policy, immigration authorities are obliged to release the individual into the United States, pending a full court hearing (which could be years down the road). There is no fee to file an asylum application, and once an application has been pending for six months, the applicant is routinely provided work authorization—regardless of the merit of the application. Once entering the country, the asylum-seeker has a year to file an asylum claim. Sessions said half of those who plead credible fear at the border do not even file a claim. “This suggests they knew their asylum claims lacked merit and that their claim of fear was simply a ruse to enter the country illegally,” Sessions said. Asylum-seekers must meet the same criteria as refugees. The difference is that an asylee applies from within the United States, while a refugee usually applies from a second country, after fleeing their home country. He said many of those who are released into the United States after their credible fear determination simply disappear and never show up before an immigration judge. If an individual fails to show at an immigration hearing, they are automatically issued an order for removal in absentia. Last year, there were 700 percent more removal orders issued in absentia for cases that began with a credible fear claim than in 2009, Sessions said. In fact, removal orders issued in absentia in all immigration cases have doubled since 2012, with nearly 40,000 issued in 2017 alone. Sessions said that with the rampant fraud and abuse, the system is so overloaded with fake claims that it cannot deal effectively with just claims. “The surge in trials, hearings, appeals, bond proceedings has been overwhelming,” Sessions said. He argued that the Obama-era policies, along with case law, have expanded the concept of asylum way beyond Congressional intent—creating more incentive for illegal immigration. “The consequences are just what you’d expect. Claims of fear to return have skyrocketed, and the percentage of claims that are genuinely meritorious has dropped,” Sessions said. In 2009, the Department of Homeland Security (DHS) conducted more than 5,000 credible fear reviews, according to Department of Justice numbers. By 2016, that number had increased to 94,000. The number of these aliens placed in removal proceedings went from fewer than 4,000 in 2009 to more than 73,000 by 2016—more than an 18-fold increase—”overwhelming the system and leaving those with just claims buried,” Sessions said. He said the increase has been especially pronounced and abused at the border. From 2009 to 2016, the credible fear claims at the border went from approximately 3,000 cases to more than 69,000. The immigration court backlog for all immigration cases sits at more than 600,000 cases—triple that in 2009. Since 2001, the United States has granted legal immigrant status (usually a green card) to an average of 26,000 asylees each year. President Donald Trump released his immigration priorities on Oct. 8, which include fixing the asylum system. More judges are also being hired to help decrease the backlog in the court system.